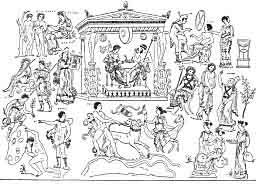 The upper scene on the right shows Hippodameia and Pelops, the latter in a Phrygian cap conversing with Myrtilos, who promises to remove a nail from the wheel of Oinomaos’s chariot in the race for Hippodameia, his future bride, a trick by which he remains victorious. Underneath are the judges of the dead, Triptolemos, Aiacus, and Rhadamanthys, the latter in the attitude of pleading a case with great zeal. The upper scene on the left represents Megara and her sons, the Heraclides, innocent victims of a cruel fate in life, who are here comforted. Below this group we see Orpheus with lyre in hand, approaching the palace to ask Persephone for a release of Eurydice. The Erinyes, or avenging demons (called ΠΟΙΝΑΙ) in the picture have lost their terrible appearance and let the singer pass by unmolested. 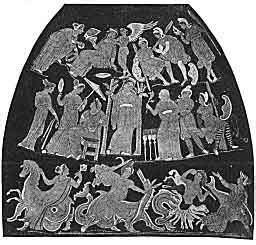 HUMAN SACRIFICES AT THE FUNERAL PYRE OF PATROCLUS. Wall picture of a tomb in Vulci. The Greeks, equally with other nations, feared punishment after death as the greatest evil, and their belief in hell can be traced back to the dawn of the history of Greece. The most ancient description of the Greek conception of the land of the dead, which is found in Homer, resembles the Jewish Sheol in so far as Hades is the abode of the shades of the dead, both good and evil. It is a gloomy place; there is a grove of willow and poplar trees, and a large lawn covered with asphodels. The shade of Achilles declares that he would rather be upon earth a day laborer in a poor man’s employ than ruler in the land of the dead. While the oldest reports do not as yet contain any reference to a reward of the good (for even Achilles shares the sad fate of all mortals), we learn of the tortures to which the wicked are subjected,–Tantalus, the Danaides, Sisyphos, Ixion, Oknos. 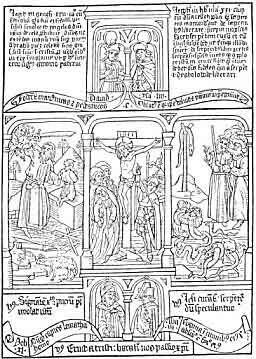 CHRIST’S DEATH ON THE CROSS AND ITS PROTOTYPES. The immolation of Isaac shows Christ’s death in its connexion with human sacrifice, and the story of the serpent lifted up in the wilderness exemplifies the healing power of faith. TUCHULCHA, THE DEMON OF INFERNAL TORTURES ACCORDING TO THE BELIEF OF THE ETRUSCANS. CHARUN, THE ETRUSCAN DEMON OF DEATH, WAITING FOR A VICTIM. OKNOS AND THE DAUGHTERS OF DANAOS IN HADES. Oknos (i. e., the Tardy or Inattentive One) weaving a rope of hay which is devoured by the donkey, and the daughters of Danaos endeavoring to fill the urn without a bottom. Homer represents the dead as unsubstantial forms, like dream images. However, an exception is made in the case of Hercules, whose shadow is in Hades, while Hercules himself, who is an Immortal, lives among the gods in Olympus (Odyssey, XI., 601-626). Another hero whose fate after death is more cheerful than that of common people is Menelaos. Being a son-in-law of Zeus, the husband of Helen, who is apparently conceived as the goddess of the moon, he lives in Elysion where Rhadamanthys rules. There the people live in ease. There is no snow, no winter, no storm, but only gentle and refreshing zephyrs blow from the ocean. The Egyptian origin of the belief in Elysion is guaranteed by the name Rhadamanthys which is the god Ra Amenthes, the Lord of the Hidden World, Amenti. IXION ON THE FIERY WHEEL. Underneath an avenging Erinys, Hephaestos, the Smith of the gods, looks at the wheel, his handiwork, with apparent satisfaction. Hermes is ready to return to the Upper World. Archaeologists have not yet succeeded in interpreting the significance of the angel-like figures on both sides of Ixion. Ixion, a Thessalian king, committed a murder, but was lustrated by Zeus himself who admitted him as a guest to his own table. But the criminal lusted after Hera, the queen of the gods. In her place he embraced a cloud which bore to him the unruly race of Centaurs. 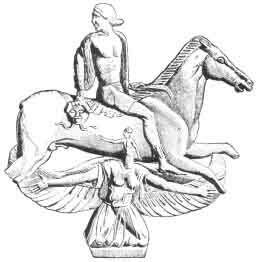 Thereupon Zeus had Ixion fastened to a fiery wheel in Hades. 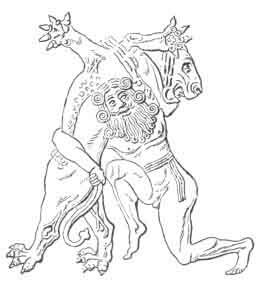 The suffering Ixion is commonly regarded as the mythological precipitate of a former god of the sky, a rival of Zeus; but the features of his divinity have paled in the human conception of a later age which was no longer conscious of the mythological significance of his deeds. GIGANTOMACHY; THE GIANTS STORMING HEAVEN. Bas relief of an ancient sarcophagus. Now in the Museum of the Vatican. GIGANTOMACHY; THE GIANTS STORMING HEAVEN. An ancient Greek frieze. “When Zeus had driven the Titans out from heaven, huge Earth bare her youngest born son, Typhoeus, . . . . whose hands, indeed, are fit for deeds on account of their strength. . . . . On his shoulders there were one hundred heads of a serpent, of a fierce dragon, playing with dusky tongues. From the eyes in his wondrous heads fire struggled beneath the brows. From his terrible mouths voices were sending forth every kind of sound ineffable, the bellowing of a bull, the roar of a lion, the barking of whelps, and the hiss of a serpent. The huge monster would have reigned over mortals unless the sire of gods and men quickly observed him. 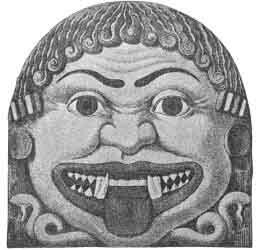 Thus the old Greek demons merely changed names and reappeared in new personalities. In this shape they were embodied into the canonical books of the New Testament and became the integral part of the new religion, which at that time began to conquer the world. Venturing down to Hades for the purpose of bringing up Persephone, the daughter of Ceres, they are made prisoners and bound by an Erinys. Theseus is at last rescued by Hercules. Pluto holds in his hand a scepter on the top of which sits the dismal owl as an avis funebris, Persephone carries two cross-torches. The Greek idea of salvation is mirrored in the legends of Hercules, Bellerophon, Theseus, Dionysius, and other myths, which had become dear to the Greek mind through the tales of poets and the works of artists. The powers of evil which Hercules overcomes are represented as a lion, a dragon, a wild boar, harpy-like birds, and a bull. In addition he captures the swift hind of Arcadia, he cleanses the stables of Augeas, tames the man-eating mares of Diomedes, conquers Hypolyte, the queen of the Amazons, brings the oxen of Geryon from the far West, and carries Cerberus to the upper world. PERSEUS WITH THE HEAD OF THE DECAPITATED MEDUSA. The poet Peisander (who lived about 650 B. C.) wrote an apotheosis of Hercules, called the Heracley, which contributed much toward idealising the hero. Later Greek philosophers, such men as Xenophon and the sophist Prodicus (Xen., Mem., ii. I. Plato, Symp., 177 B.) regarded him as the realisation of divine perfection, and now it became customary to look upon the old legends as perversions of a deeper religious truth. Epictetus, who speaks of Hercules as the saviour, and as the son of Zeus, says (iii. 24) Do you believe all the fables of Homer? “Hercules is called repeller of evil (ἀλεξίκακος), leader in the fray (πρόμαχος), the brightly victorious (καλλίνικος) (the Greek καλός is not limited to the definition of beautiful as we use the word), the celestial (ὀλύμπιος), destroyer of flies, vermin, and grasshoppers (μυίαργος, ἰπόκτονος, κορνοπίων). He, the solar hero, is identified with Apollo, the sun-god, in the names prophet (μάντις), and leader of the Muses (μουσαγέτης). Trendelenburg has discovered a passage commenting on this or a similar picture in Achilles Tatius, and explains it as follows: Andromeda, adorned as the bride of death with girdle, crown, and veil, is tied to two poles. Above her Cupid stands engaged with women in the preparation of a wedding. Andromeda’s old nurse hands her a twig. Behind and above the nurse are guards with Phrygian caps and arms. On the left, Cassiopeia, Andromeda’s mother, who exhibits the vanity of which the legend accuses her, is seated in conversation with her servants. 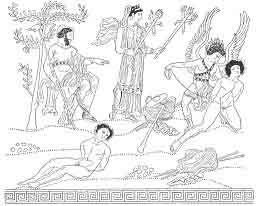 Underneath Perseus fights the monster, which scene is witnessed by three Nereids, one riding on a sea-horse, one on a dolphin, and the third resembling the typical figure of Scylla. The monster differs here from the typical Medusa figure. The use of the Triquetra (three legs) is frequent in the three-cornered island. The ears of wheat indicate the proverbial fertility of Sicily, the granary of Rome. THE GORGONEION ON THE SHIELD OF PHIDIAS’S ATHENE. The head of the Medusa is surrounded by scenes of a battle with Amazons. 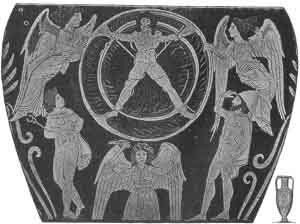 One of the fighters (the man with the bald head) is supposed to be a portrait of the artist Phidias. GORGONEION, ANCIENT FACE OF THE GORGON MEDUSA. Figures of the lion -killing saviour are also found on Asiatic coins and on Assyrian cylinders. Some of the tales of divine saviours may be ultimately founded upon local Greek traditions, but many features of these religious myths indicate that they were introduced early from the Orient whose religions began to influence the occidental nations at the very dawn of their civilisation. 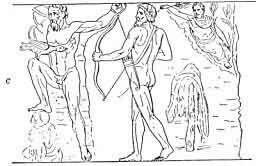 Thus Hercules is the Tyrian Baal Melkarth, probably identical with the Babylonian Bel,–the conqueror of Tiamat; and his twelve labors are the deeds of the sun-god in the twelve months of the year. Phœnix-like, he dies by self-combustion and rises in a transfigured shape from the flames of the pyre. The Jews also appropriated the figure of this solar hero in the shape of Samson whose strength is conditioned by his hair, as the power of the sun lies in his rays. In spite of the strong admixture of foreign mythology, Hercules has become the national hero of Greece, and the Greek idea of salvation has found in him the most typical expression, which has been most beautifully worked out by Æschylus in a grand tragedy which represents Prometheus (the fore-thinker) as struggling and suffering mankind, tied to the pole of misery by Zeus as a punishment for the sin of having brought the bliss of light and fire down to the earth. But at last the divine saviour, Hercules, arrives, and, killing the eagle that lacerates the liver of the bold hero, sets him free. PROMETHEUS TIED BY ZEUS TO THE STAKE (OR CROSS) AND EXPOSED TO THE EAGLE; RESCUED By HERCULES. I. Deukalion and Pyrrha, naked and unacquainted with the use of fire. III. Prometheus tied to a rock and delivered by Hercules. In the background the mountain-god Caucasus. II. Prometheus forming man out of clay, and shaping his fate with the assistance of the gods. In Christianity the struggles of the saviour receive a dualistic interpretation and are spiritualised into a victory over the temptations of the flesh and other worldly passions. The conception of evil as hell received a philosophical foundation in the dualism of Plato who did not shrink from depicting its minutest details; and his views of the future state of the soul, its rewards in heaven and hell, are in close agreement with Christian doctrines, even in most of their details, with the exception of the doctrine of the transmigration of the soul. “He [Er, the son of Armenius] said that when his soul left the body he went on a journey with a great company, and that they came to a mysterious place at which there were two openings in the earth; they were near together, and over against them were two other openings in the heaven above. In the intermediate space there were judges seated, who commanded the just, after they had given judgment on them and had bound their sentences in front of them, to ascend by the heavenly way on the right hand; and in like manner the unjust were bidden by them to descend by the lower way on the left hand; these also bore the symbols of their deeds, but fastened on their backs. The idea of the rising and sinking of the wicked in hell is similar to the Buddhist view of Buddhagosha who in his parables (translated by Capt. T. Rogers, R. E., pp. 128-129) tells us how the condemned go up and down like grains of rice in a boiling cauldron. 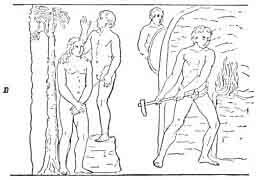 The conceptions of the mouth of hell, of the fierce tormentors and the various punishments are probably older than Plato; they reappear in the gnostic doctrines and were retained by Christianity down to the age of the Reformation. The dualism that underlies Plato’s views began to be taken more seriously by his disciples, the Neo-Platonists, and reached an extraordinary intensity in the beginning of the Christian era. The philosopher longed for death, and the common people feared the terrors of the next life. The idea of immortality became more and more accepted by the masses of the people; but there were many to whom it was no welcome news, for it served only to enhance the fears of man’s fate after death. Acquaintance with other religions revealed new terrors everywhere. The Egyptians’ dread of judgment in the nether world, the Jews’ horror of Gehenna, the Hindus’ longing for an escape from future sufferings, were now added to the Greek notions of Hades, and rendered them more terrible than before. 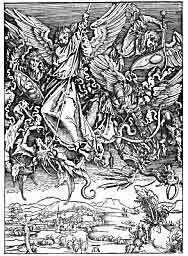 The Christian conception of hell is more fearful and at the same time drastic than any one of the older beliefs in future punishment. Lucian tells the story of Peregrinus, surnamed Proteus, who after various adventures became a convert to Christianity. He would have been forgotten and his name would never have been mentioned in history but for the fact that in the presence of a great crowd at the Olympian festivals he burned himself to death on a big pile of wood. This gem (a Christian New Year’s present) represents the death of a martyr. The letters A N F T mean annum novum felicem tibi.